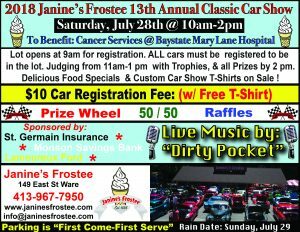 The 14th Annual Car Show for Charity has been scheduled for Saturday, July 27th from 10am-2pm !!! Information of Sponsors will be available soon ! We encourage the public to attend, as this event is not just for car guys, it’s a charity event to help people in need. Stop by and help out the cause !!! Get those hot rods ready, because the car show is coming ! We will have Live music from “Dirty Pocket”, awesome food specials, 50/50, tons of raffle prizes to win, a prize wheel, great sponsors, and of course a whole lot of cool cars to check out ! Bring your friends and enjoy the day. Print out the flyer and share with friends !All we need is some great weather and the day will be awesome, stop by and check out the show. THE 2019 FLYER WILL BE READY SOON< MOST OF THE INFO WILL BE THE SAME !!! Copyright ©2016 Janine's Frostee. All Rights Reserved.